Go to the Sears BigCommerce Integration App. On the top navigation bar, click the Orders menu. All refund orders are listed on this page. To get the refund order status, click the Get Refund Status button. 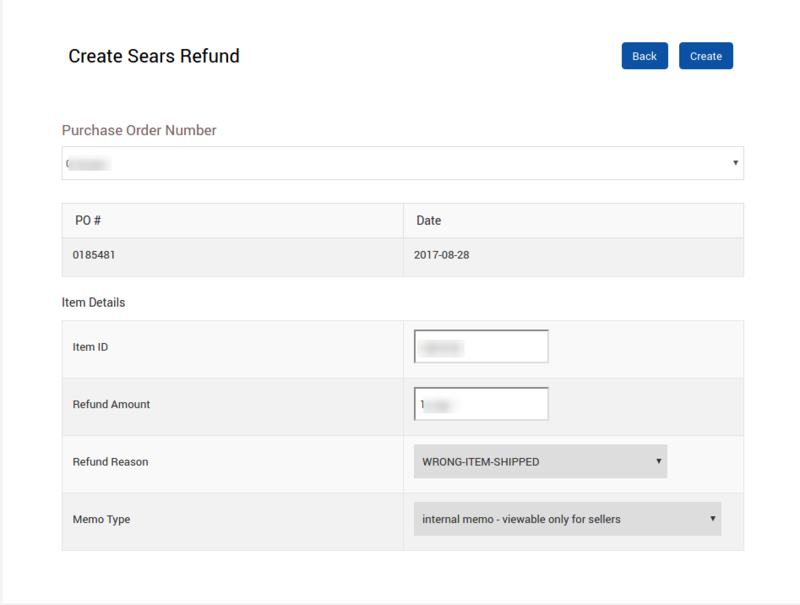 The latest status of the Refund order is retrieved from Sears.com if any and appears in the respective row of the STATUS column. Also, a success message appears on the page. Click the Create Sears Refund button. In the Purchase Order box, enter the required Number. Item ID: Identification number of the Order Item for which the admin wants to create a refund. Refund Amount: The amount used to refund the order item. Refund Reason: Select the required reason to get the refund. Memo Type: Internal or External Memo. The Refund order is created and listed on the Refund Orders page. Also, a success message appears on the page.